Come and enjoy the best of the sunny Okanagan's paradise in a comfortable well furnished home away from home. With a wide range of recreational opportunities on your doorstep or close at hand you can choose from the rich menu of Okanagan's holiday delights each day and then take time out to relax in the comforts of your nicely furnished condo. This unit is located in the middle of wine country with some of the Okanagan's best wineries close by. It also has close proximity to great golf courses in Penticton, Oliver and Osoyoos and all the amenities of a small urban center. If you are looking for a holiday with sunshine, sandy beaches and warm water for swimming you won't be disappointed. My husband and I live in the area and love the location of the condo. We are semi-retired, my husband as a school administrator and myself as a school psychologist/counsellor. Our boys grew up on the lake and we feel privileged to have had the opportunity to call this area home. It is in a great location. There are all forms of water sports and a bike/walk path along the river beside the complex and two wonderful beaches nearby. Wineries and golf courses are a short drive away. The lake warms up beautifully in the summer and at this end of the lake, calm waters await the skiier and wake boarder. thjere is also very good bass and trout fishing in the south end of the lake. Easy to access the water on foot or by boat. Boat launching and boat moorage close by. Grocery store next door (IGA). Lots of parking. Great scenery and short drives to all the attractions and recreational opportunities of the south Okanagan. Bike/walk path to Penticton starts beside the condo. Full bathroom with full size tub and shower, large vanity counter, mirror sink and cabinets. The complex is located near a large IGA grocery store, Pharmacy and other convenience stores and restaurants. The complex is located on the River Walk along Okanagan River, flowing out of Skaha lake. 100 meters from lake. Table and seating for 4 plus two more seats at the kitchen counter. common area lawn and patio near river side. A 10 km. lakeside walk/bike path beside complex, two sandy beaches and picnic parks within a few hundred metres, large IGA grocery store adjacent building, famous Tickleberries Ice cream parlor near by, several great golf courses, wineries and fruit stands within a few minutes drive. Wildlife reserve observation area and hiking/mountain biking trails within a short drive. We had a wonderful time the 3 nights we were there. The location was very close to the golf course (Fairview Mountain) that my husband likes to play. The path pictured at left was lovely. Particularly great for me as it is flat and I just had major back surgery 3 months ago. The elevator was really appreciated for the same reason. It was nice and quiet as there were very few people staying at this time of the year which we enjoyed. I'm not sure if it would be in the middle of the summer with lots of children around. Joan and Phil were very helpful. The apartment had every thing we needed for a great vacation, comfy bed, well equipped kitchen and great shower. No complaints at all. It is as advertised. This condo was close to a children's park, a family beach, a grocery store, a liquor mart and wineries. Very convenient for family with small children, and for those who want to stay out of the city but in close proximity. It was equipped with anything you need for a comfortable stay. From a full kitchen to a bbq on a small balcony (great for a morning coffee zen), laundry facilities, extra sheets and a pull out couch (although that was not very comfortable, we just placed the mattress on the rug, and that was fine for us). Joan is a pleasure to correspond with. We would stay at her condo unit again. What a great place! Phil and Joan were very easy to communicate with. The propert was very nice and clean. Had everything we needed. Super close to the beach which was not packed with people. 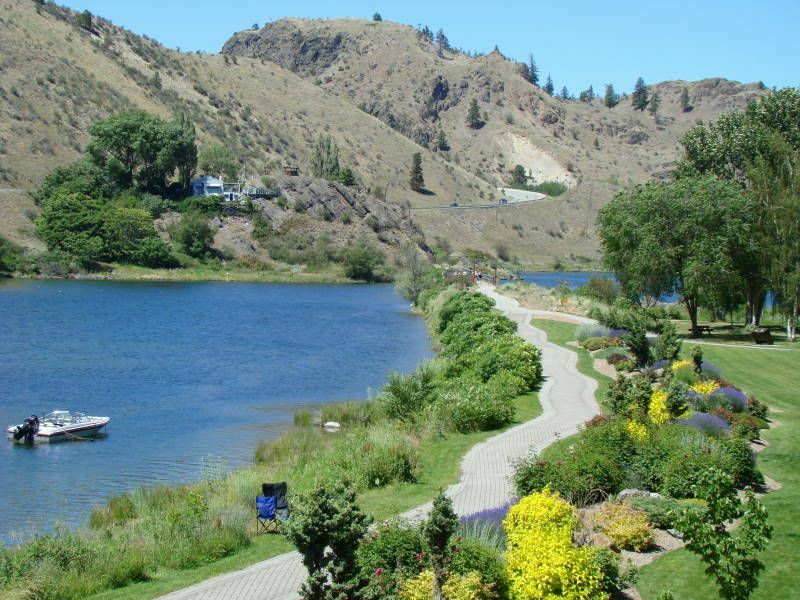 Close to Penticton and Osoyoos to enjoy the attractions but far enough from all the tourists. Would definitely go back. Thanks Joan and Phil. My husband and dog and I traveled to penticton and spent a few nights in OK falls at Joan's place. Everything was perfect! The kitchen has everything you need we bbq'd every night for dinner. There is a little beach area not far from the condo with an area for your dog's to swim and play. Joan was great to deal with and got back to me right away. The wineries in the area are amazing! I would definitely recommend this place! Nothing like getting in a kitchen that has it all. Whatever you may need is here. The owners care about your experience. Thank you! KVR bike/walk path starts at the condo and goes to Penticton. Many sandy beaches, wineries and golf courses close by. Tickleberries icecream store a few blocks away.